In April of last year, I profiled one of my favorite groundcovers - Robin's plantain (Erigeron pulchellus). Well, here's another beauty - golden groundsel. There's just one problem, I've ordered and planted two species of golden groundsel (they have the same common name) - Packera aurea and Packera obovata. And I can't tell them apart in my garden. Or perhaps only one species survived? Don't know. But whichever I've got, it's doing lovely, especially on the shady northern foundation next to an arrowwood viburnum, but also in the far back bed where it gets full sun pretty much all day. I missed taking a pic of the yellow blooms for this post, but I still got the fluffy seedheads and the lovely foliage. It's more or less evergreen here, though it can get tattered in a harsh winter like the one we just hand. So far) the old foliage seems to decay naturally and unobtrusively, never building up into an unwieldy mush (as with lamb's ears) or hanging on in a frazzled way (as with say cranesbill geraniums). The yellow flowers attract little pollinators, and the white seedheads that follow are fluffy and charming. It mostly spreads by underground rhizomes, though occasionally I think I've found a seedling or two nearby to the parent plant. It does tolerate transplantation, although it tends to sulk for a while as it gets established. In my heavy soil, it has spread by a measured pace so far. You can take a look back at this April 2017 post to see just how much ground it has covered in the last 16 months or so. I do worry that it will be harder to control in the long run. Where it's relatively easy to uproot Robin's plantain, I tried digging up Packera in a couple places where I thought it was not growing so well only to find that I missed root particles that came back stronger than ever. So consider that a bit of a warning. On the other hand, I don't think I'd mind having a lot of Packera in my landscape. It's certainly low growing enough that I don't think it would compete with bushes, shrubs or even taller, sturdier, deep-rooted perennials like Baptisia or Solidago. But I'm not sure. It will be interesting to see what happens as it starts to bump up against lawn grasses and/or other groundcovers like Erigeron. For now, it would be one of my top groundcover suggestions to anyone gardening within the native range of the lovely golden groundsels. A Bevy of June Blooms and Pollinators -- Anise Hyssop, Milkweed, Monarda and More! It's been a HOT start to summer in Tennessee. In fact, since mid-May we've been running 5 to 15 degrees above normal every day -- that means lots of days in the high 80s and low 90s with high humidity. At the same time, we've had less rain than usual, so plants are being asked to cope with the double whammy of higher than normal temperatures and less water than usual. Nonetheless, as you can see from the following photos, most plants are growing and blooming like gangbusters. What's the secret? It's not amending the soil (although I'm sure the plants would do even better if I had the time, patience, energy and/or money to do that). I think it comes down to picking the right plants for the right place - real tough guys and gals, giving them a good start with proper planting techniques, offering them a little help to get settled and then standing back to let them flourish. The Carefree Beauty rose, lightly reblooming. Agastache foeniculum reseeds just the right amount in my garden. It produces plenty of volunteers, but I'd never call it weedy. I'm digging this fortuitous combo of yellow mustard green (Brassica juncea) flowers with the purple flower spikes of Agastache foeniculum. Common milkweed (Asclepias syriaca) flowers have a lovely, sweet fragrance. This is a volunteer plant that sprouted near my mailbox. It hasn't spread much over the past few years, but it sure is tenacious. I did try digging it up once it came right back. If stems or leaves are broken, the plant exudes its trademark sticky, latex sap. Some years, the plant attracts monarch butterflies and provides food for their caterpillars, but I have not seen any monarchs yet this year. The flower umbels are highly attractive to pollinators. Here's another milkweed that blooms and flowers earlier than its brethren - Asclepias viridis, spider milkweed. For a low-growing plant it produces relatively enormous seedpods that attract startlingly red milkweed bugs. Southern bush honeysuckle (Diervilla sessilifolia) flowers. It's my first year with this plant and I'm testing it in a difficult spot on a steep hill. It seems to be doing great so far! 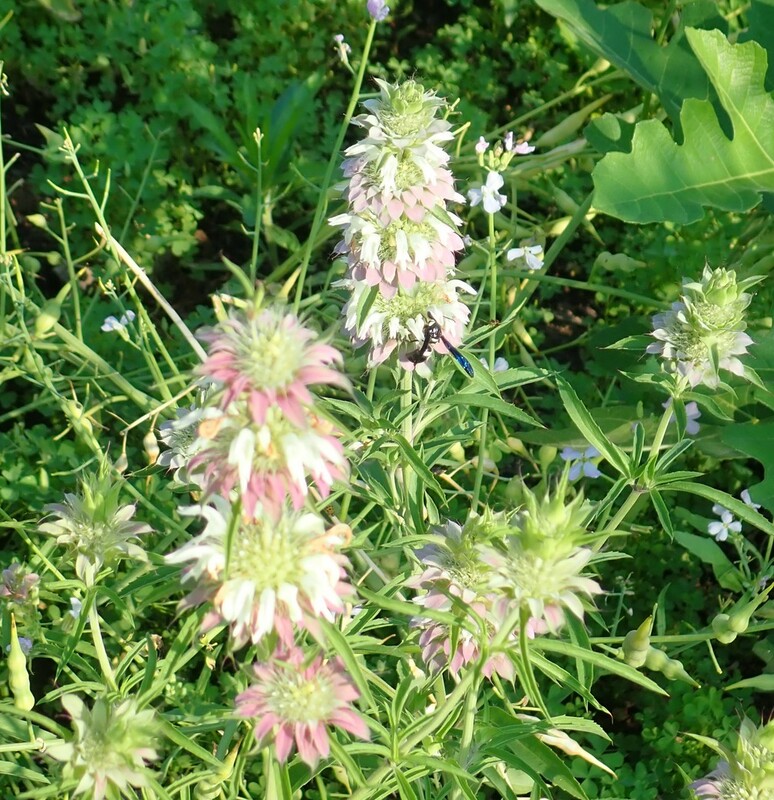 It's also my first year with the native annual Monarda citriodora, a.k.a. lemon bee balm. Monarda citriodora seems to be a big hit with the pollinators. And so far it seems much tougher - more drought tolerant and mildew resistant - than its perennial cousins. Unlike some other monardas (e.g., Monarda didyma) it does not spread by underground stems, but I have heard that lemon bee balm can be a prolific reseeder. The seeds certainly do germinate easily -- I simply scattered them in the garden beds over the winter and let nature handle the scarification / stratification process. This is a slowly expanding clump of thin-leaved mountain mint (Pycnanthemum tenuifolium). But wait... Do you see something different in its midst? Or should I say mist? Yep, it's a love-in-the-mist (Nigella damascena) seedling. Years after I started trying to remove this rampant self-seeder from my garden, it keeps popping up here and there. My carrot crop was a flop, but I left a few carrots in the ground and they have produced these pretty white umbels of flowers that attract small pollinators. Masses of partridge pea (Chamaecrista fasciculata) seedlings form an effective groundcover. Here is the first partridge pea flower that I've seen this year. Soon there will be countless yellow blooms and busy buzzing bees. The oakleaf hydrangea florets are fading from white to pink. This is an intermediate stage. Eventually they will change from pink to tan. But for now, they are adorned with a pretty rosy blush.